As an avid Batman fan I was thrilled to discover (and this began in the mid-seventies and goes on till this very day) that there are so many Batman records. Of course I am not talking of the Nelson Riddle soundtracks or the Neal Hefti tune for the 60’s television series, the Jan&Dean meet Batman LP, or the great LP with Batman songs that Sun Ra recorded. They are worth buying, but there is much much more! One of the more obscure Batman related records that I heard of, is a 45 released on the Belgium Roover Records label in the early 60’s. 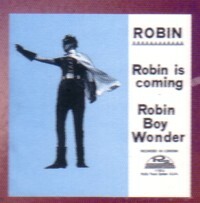 The singer is called Robin and he was a true One Hit Wonder (sorry for this). The record is extremely rare, but the A-side is on the LP The Big Freeze Volume 2, a limited edition LP with hard to find 45’s of 60’s garage bands from Belgium. The story goes that the singer was the son of a baker in Zelzate, Belgium. The father paid for the single: a local band ( The Mercury’s ) was hired to back him up and 100 copies were pressed that never got any airplay. But oh boy (sorry for this too), this is a great song! Wonder (sorry again) what is on the B-side!